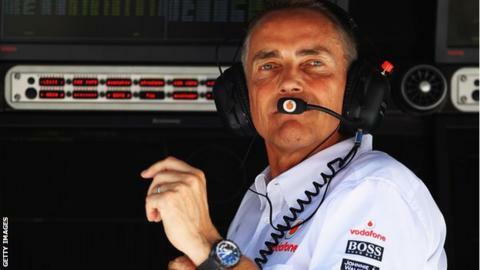 Seven of the 11 Formula 1 teams are struggling financially to the extent that they are in "survival" mode, says McLaren team boss Martin Whitmarsh. Whitmarsh, who is also chairman of the Formula 1 Teams' Association that represents the majority of the sport's competitors, said: "It's tough. "We're in the world of advertising and you only have to see how advertising is worldwide. The rate card is down. "We have taken some measures, but I think it's going to be tough for some." Whitmarsh reckons several teams will find it hard to "have a viable business model for a few years", while his opposite number at Caterham, Cyril Abiteboul, thinks world champions Red Bull are doing well financially but "everyone else is suffering". "The fundamental causes of the problem are both simple and complex. "On the simplistic front, the world is still battling with the economic problems caused by the banking crisis of 2008, and F1 is not immune. "The complicated bit: for many years the teams have been battling to get a bigger share of F1's income, which in 2011 was about £963m ($1.5bn). "There is resentment at how much money F1's commercial rights holder, the venture capital group CVC, is taking out of the sport." Whitmarsh says much of the present problem is a hangover from the 2008 global financial crisis. Advertising and sponsorship contracts signed before the crash have come to an end. New backers are thin on the ground, while existing ones are not willing to pay top dollar for the privilege of continuing. Formula 1 operates under a Resource Restriction Agreement that limits staffing levels, how much research and development teams can do and the amount they can spend on external suppliers. But that did not prevent Spanish team HRT from closing its doors at the end of last season. Others are known to be struggling, too. Ahead of this campaign, which starts in Australia on 17 March, Caterham and Marussia have had to drop well-regarded drivers who were earning salaries in favour of those who can bring sponsorship. Whitmarsh says one of the problems is that teams do not receive a big enough share of the sport's total income from the commercial rights holder, the venture capital group CVC, which employs Bernie Ecclestone to run the F1 business. F1's income was about £963m ($1.5bn) in 2011, the last year for which figures were published. That compares with the £2.6bn ($4bn) generated annually by the NFL and the £1bn ($1.6bn) the English Premier League will earn each year from next season from UK TV rights alone. Under the previous contract between the F1 teams, CVC and governing body the FIA, teams shared 47% of the sport's income. This contract, known as the Concorde Agreement, lapsed at the end of 2012. Under the new deal, which has yet to be signed, reports suggest teams will receive as much as 63% of revenue. In addition all teams have concluded new private commercial contracts with CVC, the details of which have not been made public. "Bernie has done a fantastic job for the owners," added Whitmarsh. "We can criticise him but he's doing a better job than we are. He's keeping the money on behalf of his employers. "That money whistles out of the sport and that's deeply frustrating for some of us in the sport but that's exactly what he should be trying to do. "If the teams aren't cohesive enough to work together to secure a larger share of that, then they have to blame themselves." A sports marketing expert with knowledge of F1, who did not want to be named, said: "I am not sure if seven teams are at risk but I guess at least half a dozen are likely to be not self-sufficient under the current structure. "The business environment is tough everywhere, not just in F1. "Looking at F1, the acid test should be whether the team is sustainable without support from a shareholder, who are often also sponsors. "If the answer is 'yes', then the business is healthy. If not, then teams will still probably survive but not because they are self-sufficient but only because the owners keep them going. If their parent company switched off the tap, then they would not survive."